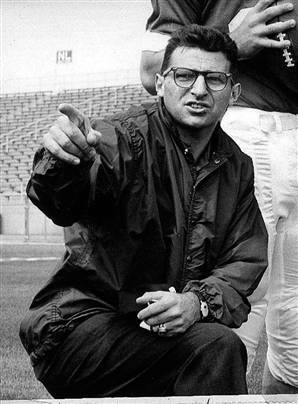 Following his death after a long battle with lung cancer, many questions have been raised about the life and lasting legacy of long-time Penn State University football coach, Joe Paterno. My friend, the Philadelphia Inquirer’s John Timpane, wrote today about social media and reactions to Joe Paterno’s death. Slate’s Torrie Bosch wondered if it was even appropriate to mourn the death of Joe Paterno. How does this image square with the coach’s indifference, or worse, about allegations of his former colleague’s sexual abuse of children? Some form of that is what a great many people said when they heard about what Joe Paterno did (or didn’t do) when informed of allegations about his former assistant Jerry Sandusky. Since that’s what my experience suggests to me, I’m inclined to accept as plausible both the Joe Paterno who didn’t push the allegations of his former assistant’s sexual abuse as vigorously as he should have, and the Joe Paterno who seemed to care for his charges like the benevolent grandfather his players and former players describe. And, today, I believe it is right and proper to mourn that human being. barred his assistant from the campus after he retired.